The levator labii superioris a.k.a. quadratus labii superioris is a muscle of facial expression. It is a wide muscular sheet; its origin spreads out via the side of the nose till the zygomatic bone. The levator labii superioris muscle has three points of origin that blend and pass into the upper lip. The angular head – levator labii superioris alaeque nasi – arises via the frontal process of the maxilla. The infraorbital head arises via the inferior orbital margin, it is the largest part. The zygomatic head – zygomaticus minor – arises via the facial portion of the zygomatic bone. All three origins attach together within the upper lip and at the time of contraction, raise the upper lip. A strap of the angular head attaches within the ala of the nose and assists in dilation of the nostril. 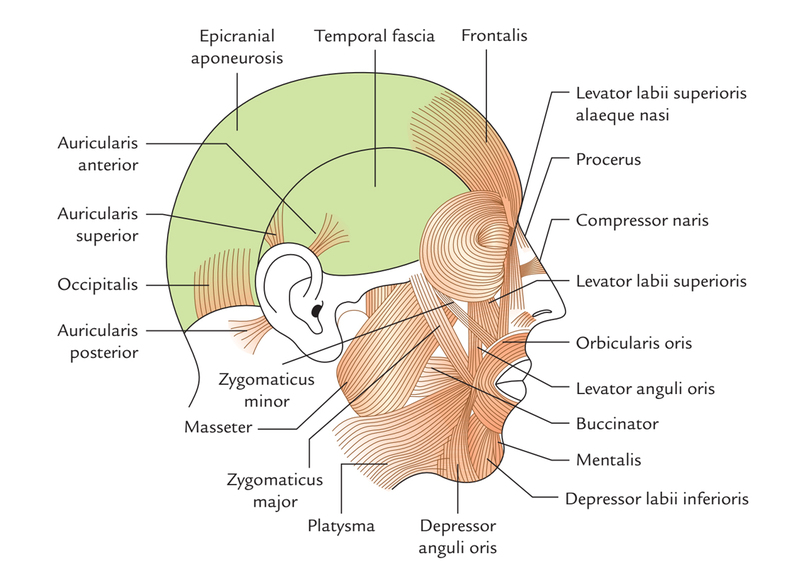 It arises deep towards the lower margin of the orbicularis oculi and acquires numerous attachments into the upper lip zone in the middle of the levator labii superioris alaeque nasi as well as the zygomaticus minor. Occasionally it is located on a deeper plane compared to these two muscles and is then partly enclosed through them. Superficial fibers attach to the skin of the nasolabial furrow, just lateral towards the wing of the nose. Other fibers travel inferiorly past the furrow and constantly attaching up towards the red lip portion within the deep surface of the skin of the upper lip. Middle fibers continue inferiorly just inferior to and parallel to the superficial layer. Then travels in the middle of the red lip as well as outer portions of the orbicularis oris, and attaches on the inside of the lip at the point where the dry red portion of the lip joins the moist mucous membrane, as well as within the red portion itself. Deep fibers pierce the mass of the outer portion of the orbicularis, while it attaches at various points into the mucous membrane within the mouth. The levator labii superioris excavates the groove in the middle of the nose as well as the corner of the mouth at the time of making sadness. Levator Labii Superioris is innervated by zygomatic branch of facial nerve. Myalgia – Pain in a group of muscles. Ischemic, as a result of lack of blood flow. Hemorrhagic, as a result of bleeding. Myopathy – Myopathy is a medical condition of the muscle where the muscle fibers do not operate correctly. It is a major structural or functional impairment of skeletal muscle. Bell’s palsy – Bell’s palsy is a kind of facial paralysis which causes incapability to control the facial muscles on the involved side of the face. Symptoms can be mild to severe. Lacerations – Irregular tear-like wounds created via direct trauma. Contusions – A contusion is a type of hematoma of tissue where injury arises in capillaries and occasionally venules through trauma, making blood to leak, hemorrhage, or spread within the surrounding tissues. Infectious myositis – An infection of skeletal muscle, which can be acute or chronic. Atrophy – The incomplete or complete degeneration of a part of the body.